Ribbons of the green courgette are folded with tortelloni, then tossed with ham, marjoram and golden slices of yellow courgette. Lean bacon will do instead of the prosciutto or ham. Slice the yellow courgettes into rings about as thick as £2-coins. Sprinkle lightly with salt and leave for 30 minutes in a colander, then rinse and drain. Meanwhile, slice the green courgettes vertically down the middle and use a potato peeler to slice them into long, thin tagliatelle-like ribbons. Sprinkle lightly with salt and leave for 10 minutes in a colander to soften a little. Rinse and drain. Meanwhile, heat the oil in a large frying pan over a medium heat. Add the diced prosciutto or ham and the garlic and fry for a couple of minutes. Add the drained yellow courgettes and toss over the heat for 6-8 minutes till the courgettes take a little colour. Add the marjoram. Meanwhile, bring a large pan of salted water to the boil, drop in the tortelloni, bring back to the boil and cook till tender, about 4 minutes. Just before the end of cooking, drop in the green courgette ribbons so they cook lightly. 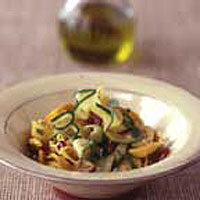 Drain the pasta and courgettes, and toss with the contents of the frying pan. Season to taste and serve. This is good with grated Parmesan and also drizzled with olio santo - olive oil infused with peperoncini (fiery little red peppers). You can make your own by infusing olive oil with Thai chillies.